A recent column in the Wall Street Journal Opinion Journal discusses a fundamental problem of raising taxes. People are rational actors, and beyond a certain point, higher taxes result in their voting with their feet. They move elsewhere, to places where taxes are perceived to be more reasonable. Everyone doesn’t react this way, of course. But enough do that it can mean higher taxes result in lower tax revenue for the taxing jurisdiction — local, state, or federal. The column was written by Arthur Laffer and Stephen Moore. 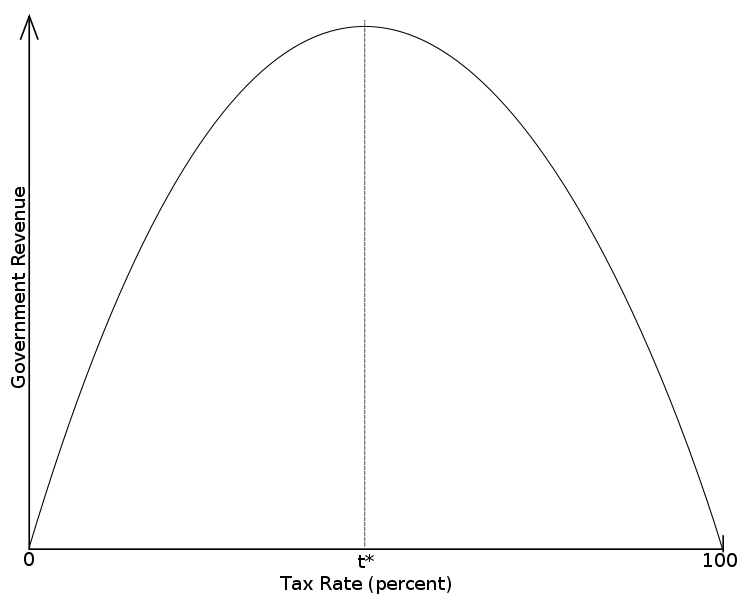 That’s right, Arthur Laffer of the famous (or infamous, depending on your point of view) Laffer curve. This represents the fact that raising taxes beyond a certain point actually reduces tax revenue. It’s obviously accurate — a 100 percent tax will result in essentially no revenue because no one will work. The debate centers around the point at which raising taxes has a negative result. Those of a certain ideological cant will refuse to even read the column because Laffer co-wrote it. That represents the kind of closed-mind approach to public policy that results in ever-higher taxes, followed by draconian measures to prevent people from making the rational decisions that will permit them to avoid the taxes. The result, of course, is loss of freedom and quality of life. Or, political leaders demand that citizens accept higher taxes by threatening to cut the most essential services, like education, police, and fire protection. Or they threaten to release thousands of imprisoned illegal immigrants and other felons. Rarely do they make any effort to cut non-essential services and benefits that are supported by politically powerful special interests. Here’s the problem for states that want to pry more money out of the wallets of rich people. It never works because people, investment capital and businesses are mobile: They can leave tax-unfriendly states and move to tax-friendly states. Those who disapprove of tax competition complain that lower state taxes only create a zero-sum competition where states “race to the bottom” and cut services to the poor as taxes fall to zero. They say that tax cutting inevitably means lower quality schools and police protection as lower tax rates mean starvation of public services. They’re wrong, and New Hampshire is our favorite illustration. The Live Free or Die State has no income or sales tax, yet it has high-quality schools and excellent public services. Students in New Hampshire public schools achieve the fourth-highest test scores in the nation — even though the state spends about $1,000 a year less per resident on state and local government than the average state and, incredibly, $5,000 less per person than New York. And on the other side of the ledger, California in 2007 had the highest-paid classroom teachers in the nation, and yet the Golden State had the second-lowest test scores. Or consider the fiasco of New Jersey. In the early 1960s, the state had no state income tax and no state sales tax. It was a rapidly growing state attracting people from everywhere and running budget surpluses. Today its income and sales taxes are among the highest in the nation yet it suffers from perpetual deficits and its schools rank among the worst in the nation — much worse than those in New Hampshire. Most of the massive infusion of tax dollars over the past 40 years has simply enriched the public-employee unions in the Garden State. People are fleeing the state in droves. The same logic also applies to federal taxes on businesses and individuals. One of the reasons so many businesses re-locate overseas, move some operations overseas, and outsource services is to avoid taxes. People do the same thing, essentially, by hiding money overseas or even moving to other countries and renouncing their U.S. citizenship. What’s the answer? A reasonable balance between spending and taxing, as perceived by the people who have to pay the taxes. Can we do that by putting questions of taxing and spending directly to the people? The experience of California is instructive. The people of that financial disaster of a state have just voted again to prevent higher taxes and protect desired services, which is a major factor in the state’s financial crisis. It seems the only real answer is leadership by politicians wise enough to manage economic policy. Instead, we get leaders of the left and right who are so slavishly devoted to ideology that we get the mess we’re now struggling with. Too bad. One issue not addressed by Laffer and Moore is the demographics of the states discussed in the article. Another topic, another day. Tony Robbins wrote that at the base of human psychology, people ultimately do things (and doing no thing is, logically, doing some thing) because that thing is pleasurable, or that thing helps them to avoid pain. The citizen is an economic agent in society, to take a particularily capitalist viewpoint, people will not be satisfied with higher taxes if they do not feel they are getting “value for money”, it is particularily hard with regards to government spending in that it is a more complex decision than buying i-don’t-know, food. The weighing up of the benifit for cost is harder, and particularily with governments, many “benifits” are hidden, or less obvious than with other forms of spending. Ergo, it is difficult to prove to a taxpayer that they are getting value for money. As an added bonus, media focus tends to be negative and as governments mistakes make good news, there tends to be (especially in recent years) a tendancy to not like the government in power, regardless. This also weighs into the whole “value for money” argument in terms of a taxpayer as an economic agent. Laffer is, in my case anyway, preaching to the choir! And why do we get these kinds of non-leaders? Because people vote for the ones that tell them what they want to hear. The amusing thing is that they are really not voting for the candidate, they’re voting for the candidate’s speech writers and coaches. Carla, I agree that the Laffer curve isn’t useful in terms of providing a basis for economic decision making. It simply states an obvious truth—if you raise taxes to 100 percent, tax revenue will disappear, for the most part. But so what? The trick is to design taxing and spending policies that permit government to perform its valid functions while taxing at a level that isn’t counterproductive. What the Laffer/Moore article is about, though, is the observable fact that beyond a certain point, those who have to pay taxes will do what they must to avoid them if they perceive the taxes as unfair and excessive. Leftists can talk all they want to about taxing the rich, redistributing income, “from each according to his ability to each according to his need,” and on and on. But until taxpayers are denied the freedom to move when and where they wish and to act in their own best interests, this fact has to be accounted for and dealt with. If you want to be certain that the rich will stay in place and roll over without objection as they’re fleeced to support humongous government programs, then you’re going to have to have laws that restrict freedom. Don’t let the productive people who drive progress, create jobs, and work their butts off move themselves and/or their companies to another state. Stifle all economic free will. Treat them as the nasty exploiters of the working class that they really are. Hmmm. Seems like that’s been tried, as I remember…. I agree that the dodging of taxes should be accounted for and dealt with. This is why Obama is attempting to close the loopholes on U.S. businesses who try to store taxable revenue offshore. Many people and businesses have been socialized in the last 30 years that government is bad and taxes (as a whole, in concept) are bad. That’s the crux of the issue, frankly. The Laffer idea that they dodge their responsibility because taxes are deemed “unfair” or “excessive” doesn’t address this. The “own best interest” of the individual isn’t the only consideration–and that’s again, part of the negative socialization toward government and taxes. Carla, I agree with you, although I’m not sure this all happened within the past 30 years. I can’t imagine a time when people were socialized to like taxes. I take a bit of exception to the term “dodging taxes.” In both theory and law, the words used are “avoiding” and “evading.” People are expected to avoid taxes by all legal means; the tax code even provides for that and, in some cases, uses avoidance as an incentive. Evading taxes, on the other hand, is illegal. No matter what you or I think, the problem is what people who have to pay higher taxes think. The economy rises or falls on what people think, feel, fear, like, and dislike. If someone who owns a business that employees 50 people believes that his state and local taxes, in addition to the federal taxes everyone has to pay, are unreasonable, he’s free to close his business or relocate it. If Arkansas offers not only lower state/local taxes but a tax incentive for him to move his business there, why wouldn’t he? That means that, say, New Jersey loses not only the new, higher taxes he would have paid, but the old taxes he paid plus the employment of 50 people. Arkansas, with lower taxes in general and equal or better services, gains a business and jobs for 50 of its people. There are only two ways to stop this natural flow—don’t raise taxes beyond what’s tolerable, or deny people the right to move themselves and their businesses. The first seems impossible these days, given our political leadership in many states and at the federal level; the second, I would hope, is unacceptable to everyone. Remember the goose that laid the golden eggs? I don’t think anyone is dumb enough to kill the goose, but they may try whipping her with a stick to make her lay more golden eggs. Punish the goose too much, and she’ll pack her little knapsack, waddle off to more pleasant places, and lay her eggs there.